STARS 100 (Super Trans Asian Runways) Call Out! Home/Uncategorized/STARS 100 (Super Trans Asian Runways) Call Out! STARS 100 (Super Trans Asian RunwayS) is a series of workshops starting Feb 1 (every two weeks) on a variety of topics including confidence building, clothing/costume design & construction, voice coaching, dancing, and RUNWAY!!! All of this will culminate in an Art and Fashion Show on May 31!!! Super FUN and come LET’S HAVE A KIKI!!!! The first workshop is this Friday Feb 1, with more on the way. Food at 6:30 pm, workshop starts at 7 pm. We are still looking for participants, models, performers, storytellers, writers, production peeps, etc. 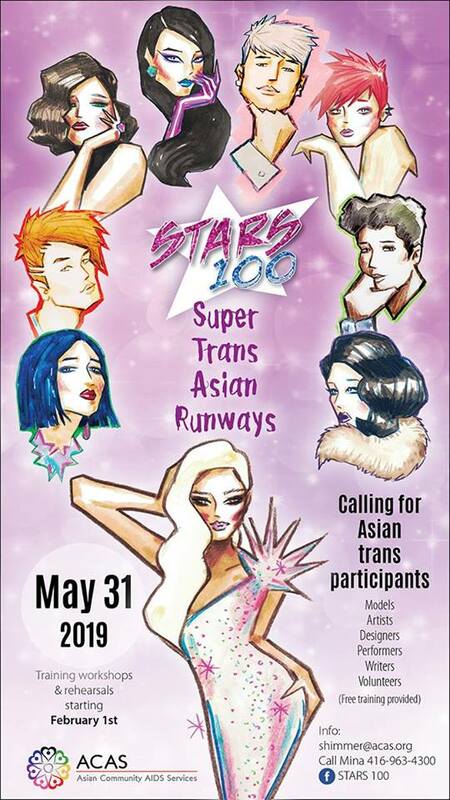 Message the STARS 100: Super Trans Asian Runways page if you have more questions.